This Resource provides Internet links that may be of interest to your patients diagnosed with colorectal cancer. Many of these links will provide invaluable information to your patients and will help them understand their cancer, cope with treatments, and improve their quality of life. To use this resource in your clinical practice, please review the material below and select the individual links that you believe will be useful for each of your patients. Has a patient information section that includes podcasts on colorectal cancer risks and screening tests, as well as tools to help you find a gastroenterologist locally. Gives an overview of the disease as well as illustrations of affected areas. Goes into more detail about diagnostics and staging and the various screening tests used. Has information regarding prognosis based on types and stages of tumors. Cancer.gov through the National Cancer Institute at the NIH offers an overview for colorectal cancer, along with a fact sheet, treatment options, research information, causes, prevention, statistics and coping resources. This PDQ is an in-depth reference for general information on colon and colorectal cancer through the NIH. The site offers a downloadable colorectal cancer resource treatment option guide, workbooks, helpline (US only), links to FDA Approved drug information, treatment support tools, and links to various informational websites. Offers information on diagnosis and treatment, an Answer Line to help those with colorectal cancer questions, access to online support communities, and a monthly electronic newsletter. This is a valuable resource that offers support and information for patients, family, and friends. There is a Buddy Program that matches people for one-on-one support, and an online support program called My CCA Support. This site offers professional support services, treatment information, community support, and financial assistance information for those affected by colorectal cancer. Here you can find access to counseling and support groups, podcasts, and links to other resources. This site offers comprehensive resources for patients and others affected by colorectal cancer. There are links to community resources and events, clinical trials, awareness events, roundtables, DVDs, wellness guides, inspirational stories, and a vast number of other helpful tools. This site provides ways to get involved in community events such as fundraisers, runs, and how to start your own event. There are sections of the site dedicated to patient information, blogs, contacts, and a community and caregiver network. This is a site dedicated to preventing colon and colorectal cancer deaths throughout Europe. It is a comprehensive patient-centered site with links to community groups and activities, healthy living and eating with cancer, association meetings, current news and research, and patient stories. Through Singapore General Hospital, this site links patients to support groups and information on wellness and education. By joining this group patients can access different activities, lectures, workshops, and musical therapy. The organizations patient section offers information on risk factors, screenings, treatments, videos and colonoscopy FAQs. ASCO’s Guide to Colorectal Cancer. Choosing the Overview section will get the patient started through the in-depth guides. Guides contain information on statistics, medical illustrations, risk factors and prevention, screening, diagnosis, symptoms, stages, treatments, trials and research, treatment side effects, follow up care, and survivorship. This site offers an FAQ section with patient-centered and well written answers regarding colorectal cancer. Patients can also find various educational videos in English and Spanish. There is also a section for news items and press releases. This site is a listing of additional colon and colorectal cancer resources. The Centers’ site for disease awareness over basic overview and “fast facts” regarding colorectal cancer. It also has a section on special topics preventing other illnesses in people being treated for cancer, international cancer control, and survivorship. From this site you can also learn more about the Screen for Life: National Colorectal Cancer Action Campaign. This site offers patient education multimedia guides, podcasts, and videos in English, Vietnamese, Khmer, Cantonese, and a number of other languages. Has general cancer care links to other European organizations. Links to various publications regarding colorectal cancer. This site offers patients information on risk factors, screening options, signs and symptoms, diagnosis, treatment, and support groups. There is also a detailed downloadable patient education brochure. 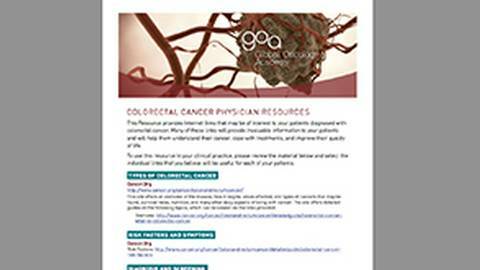 This resource provides Internet links that may be of interest to your colorectal cancer patients. The goal of these links is to provide invaluable information to your patients and help them understand their cancer, cope with treatments, and improve their quality of life.